Happy Holidays from City Weekly! Our holiday coloring contest is for kids up to 12 years old. Cool prizes will be awarded. Entries are due Friday, December 30 by 5:00pm. Download and print your coloring contest HERE, or pick one up at City Weekly. 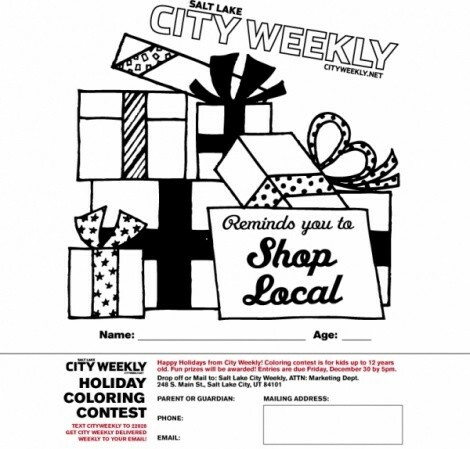 Drop-off or mail your child's completed coloring page to: Salt Lake City Weekly, ATTN: Marketing Dept.248 S. Main St., Salt Lake City, UT 84101. Text CITYWEEKLY To 22828 to get City Weekly delivered weekly to your email!